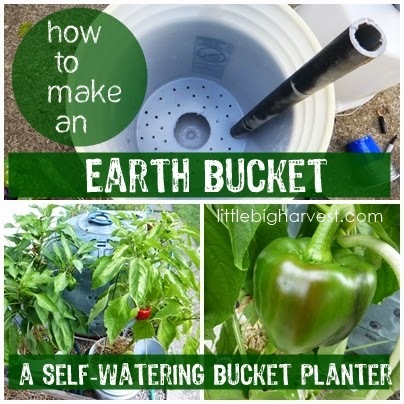 Making and using an Earth Bucket is a wonderful way to conserve water and to plant things where you might not be able to otherwise, like on your patio or driveway. While the buckets are not truly self-watering, (you do have to add water), they regulate the water you keep in their reservoir. One of the simplest self-watering containers, the double bucket, consists of one bucket or 5-gallon pail nested inside another. The bottom bucket is watertight except for a drainage hole drilled in its side at just below the bottom of the top bucket, when they are nested together. Several roomy drainage holes are made in the bottom of the top bucket, which serves as the planter. Roots eventually grow through these holes and into the reservoir in the bottom bucket. The reservoir will reduce watering chores by about half and give your plants an important safety margin on hot, dry days. The most challenging part of the entire project is creating the holes in your buckets. If you are going to make several of these buckets (I plan to line my patio with them next year), then you might like to invest in the tools that will make the job easiest on you. On the other hand, if you don't have all the 'right' tools, and don't have the money or time to go buy them (which was the case when I decided to make my two buckets last weekend), then you can get creative. 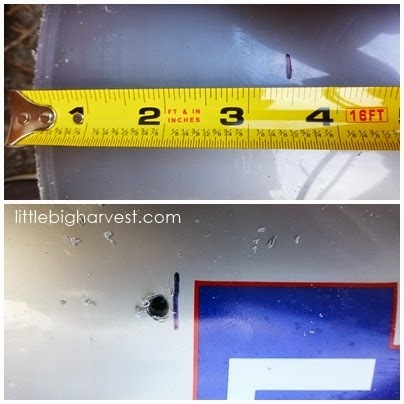 I made the necessary measurements and holes in my Earth Buckets using what I had on hand! 1. 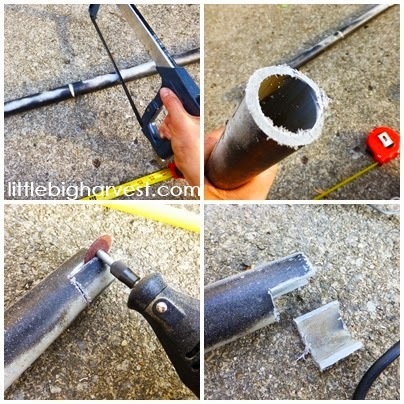 Make cuts in the PVC pipe. Cut the length of PVC that you need with a saw. You will want the pipe to extend about 3 inches above the top of the buckets when they are nested. In my buckets (regular 5 gallon), the total length needed was 25 inches. The bottom of the pipe will need a notch cut from it to allow water to flow through. This is where the pipe will be sitting in the reservoir at the bottom. I used a dremel tool to make a simple notch, pictured above. If you have a vise, you could use a hack saw to make the notch. Set the finished pipe aside. 2. 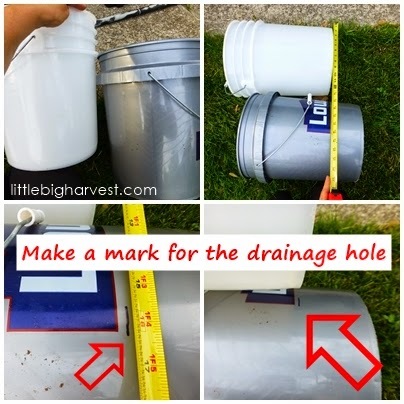 Measure and cut drainage holes. I made three drainage holes in each bucket. First, lay buckets next to each other to see where the inner bucket will be when they are nestled..Use straight edge and a sharpie to mark where the bottom of the planting bucket will be located in relation to the outer bucket. Measure where that line sat, and then using that measurement make two more lines, for a total of three marks around the outer bucket, roughly the same distance apart. Drill holes right UNDER those measurements. These will be the overflow drainage holes for the water reservoir. You don't want the bottom of the inner bucket immersed in water. I used a 1/4 inch drill bit for the drainage holes. 3. Make holes in bottom of what will be the inner bucket. This photo show what the holes need to look like: Large hole for cup to nest in, smaller hole that will fit the PVC pipe, and 30-40 small holes for the roots to grow through into the water reservoir if they want to. For me, the challenge was to get all these holes figured out. Since I don't have saw drill bits to make perfect-sized circles, I had to improvise. I traced the PVC pipe and then used the dremel around the hole until it popped out. You could also use a drill bit and make holes all around the traced line, and then cut the circle out following the drill holes with a sharp knife. If you have a set of saw bits for you drill, just find the right size and make a perfect hole. Either of these ways will work! The cup hole is a little more challenging, because you can't trace around the cup--it will make the hole too large since the cup is tapered (as you can see I traced a line on the cup below to show where it will end up nestling in the bucket). If you are using a standard 'solo' type cup, a hole 3 1/4 inch in diameter should work (this is where a 3 1/4 inch saw bit would come in handy, but as you can see, it's not crucial, you can make do!) I made a very rough 3 1/4 inch circle and used the same method for cutting it out; dremel tool around the line until it popped out. For the small holes, simply drill away. I used a 1/4 inch spade bit. 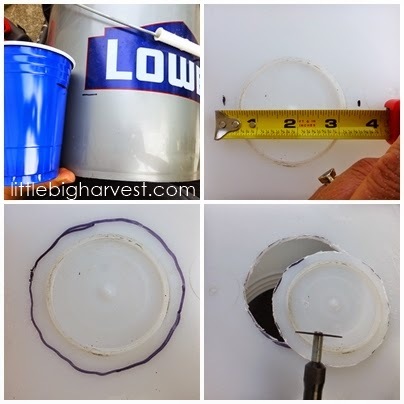 Assemble what you have done so far: place the inner bucket inside the outer bucket, and push the PVC pipe into place, down through its hole until it touches the bottom. Looking good! 4. Make cuts in the plastic drinking cup, which will be your water-wicking cup. 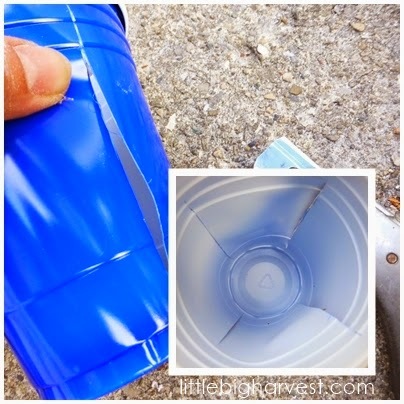 Using a sharp blade, slice 4 slits into the plastic cup, about equal distance from each other. Be careful to keep the cup intact; DON'T cut through the top or bottom! Once the cup is filled with soil and surrounded by water in the reservoir, water will wick into it through the slits, and then up into the rest of the planting bucket. Test out the cups in your assembled buckets. One of my cups fit perfectly, the other did not. The hole I cut was too big, so I made the cup snug by wrapping duct tape around the top. Once you are satisfied with how the wicking cup fits into its hole, it's time to put it all together. 5. 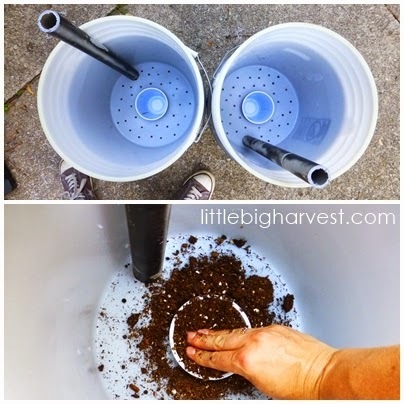 Assemble buckets completely, place them where you want them, fill with soil, and plant! Wet some of your growing medium and press it into the wicking cup (I used a mix of compost and vermiculite, which will help retain water). 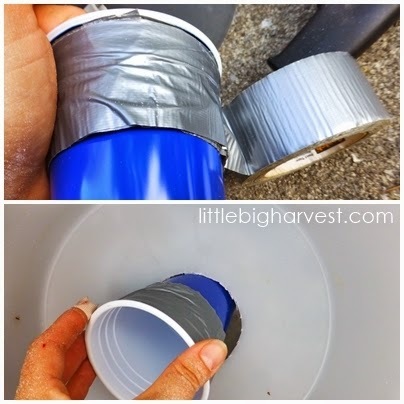 Fill the bucket the rest of the way, making sure to keep the pipe tucked against the side. Now you can plant! 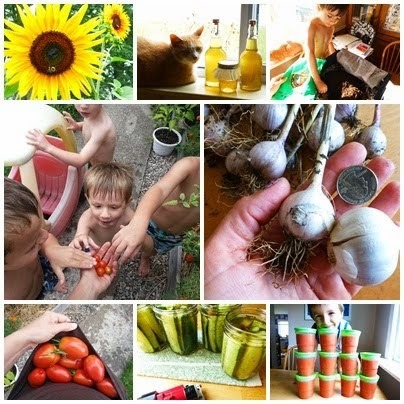 Plants that love Earth Buckets: Peppers, Tomatoes, Eggplant. Experiment with whatever plant you want! 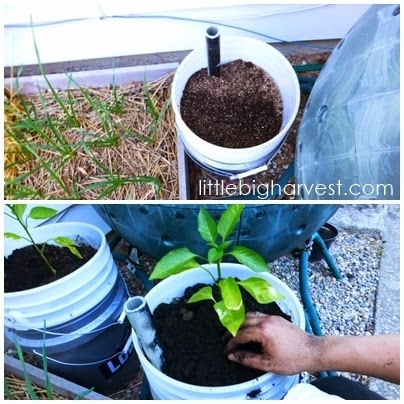 About once every week or two weeks, fill your Earth Bucket with water through the PVC pipe watering tube. 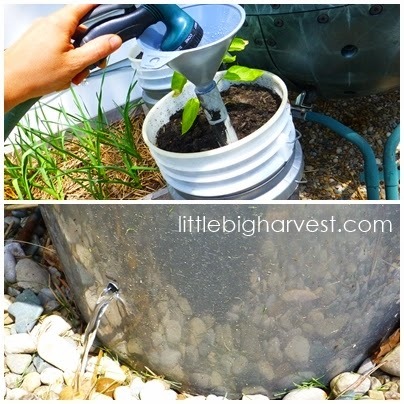 I find this easiest using a funnel, which I leave tucked in by the buckets. When water pours from the drainage hole, the reservoir is full. To retain more water: Cover the surface of the bucket. I used a thick layer of straw. Some people use black garden plastic, or the lid that came with the bucket with a hole cut in it for the plant. Another water-retaining tip: if possible, bury the bucket into the ground, leaving the drainage hole above ground. This will help prevent water from evaporating as quickly. 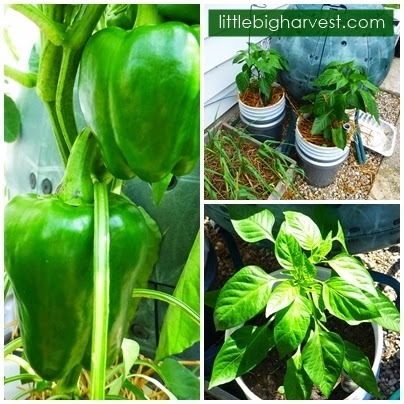 We grew peppers in our Earth Buckets, and they did AMAZING! Click here for our update! In a future project, I plan to make a series of Earth Buckets all connected to one water source, fed directly from the gutters on my house. Stay tuned! Once I made two buckets, I gained a TON of confidence, which is huge for this power-tool fearing girl. I know that the next time I do this project it will be easier. You have to start somewhere, and with the tools you have...I can't encourage you strongly enough--just gather up what you have and try it. *if you need a Video: Sometimes all the pictures in the world don't help, and I totally get that. I like the videos on this site. Scroll down to the third video, "build the 2 bucket system." 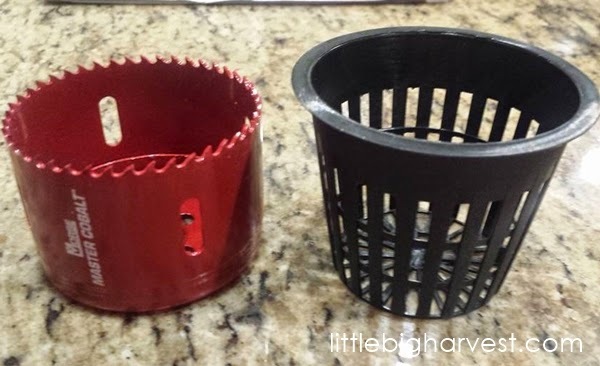 Pictured here is 2-7/8 inch hole saw (attachable to your drill) and a 3-inch net pot. Click the pictures below to see them on Amazon. This is so cool! I had heard of these planters before but never really understood what it was. Thanks for showing the how-to, I'll definitely be making some of these for next planting season! Here are a couple tips for viable watering of plant holders and pots. The bigger the grower, the less watering they will require after some time.